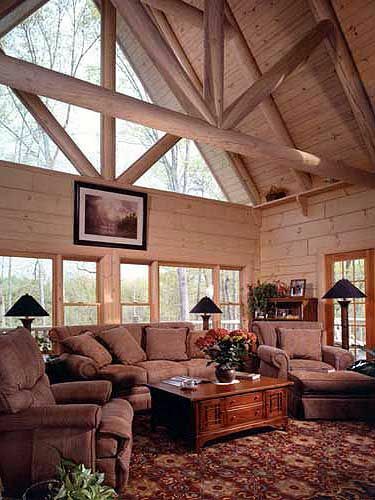 This attractive log home has an awe-inspiring design which is evident as soon as you first approach it. 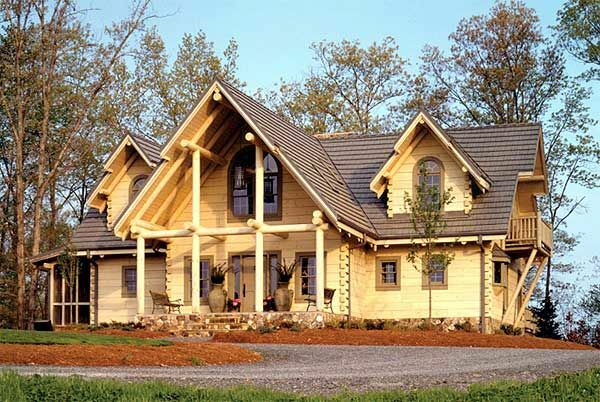 The huge gabled dormer over the front porch with a spectacular log frame is an eye-catching design that is sure to please all. The two gabled dormers in the roof add to this pleasing aesthetic, while the lighter-toned wood is rarely seen, but works perfectly. This stunning log home is listed on Architectural Designs as Plan 59017ND. The home has 2,569 square feet of internal living space (238.7 square meters), with a floor plan which includes three bedrooms, four bathrooms, and an expansive great room. This plan is ideal for those looking for a larger log cabin which maintains the ethos of rustic living, yet is balanced with the functionality of a modern family home. Let's take a look around. The living space of the house is centered around an expansive great room with a soaring cathedral ceiling which is open to the upper floor. The huge windows flood the home with natural light, and multiple access points to the large wrap-around deck perfectly transition your lifestyle from indoors to outdoors. The main living room is anchored by a commanding stone fireplace which contrasts beautifully with the lighter tones of the wood. Despite the high ceiling and large windows the house is easily heated, creating a cozy retreat for the colder evenings. 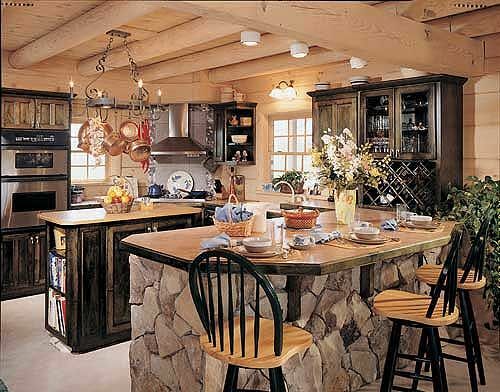 The gorgeous country-style kitchen has bold, dark cabinetry which clearly defines the room in contrast to the bright walls. The distressed tones in the wood are a great rustic feature, while the high-end stainless steel appliances add a sense of modernity. 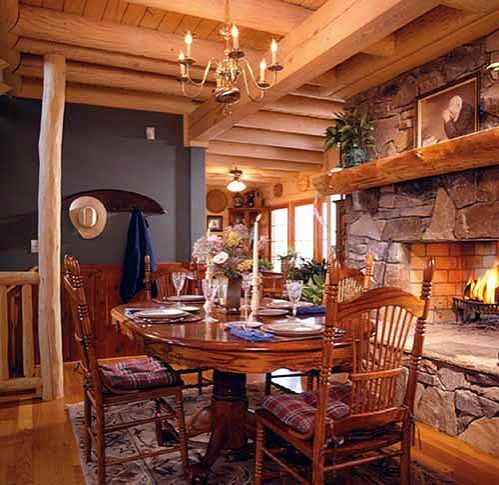 The dining room is adjacent to the kitchen and benefits from the stone fireplace. This setting can be as formal or as informal as you please, and the kitchen's breakfast bar is perfect for the children while the adults entertain guests. 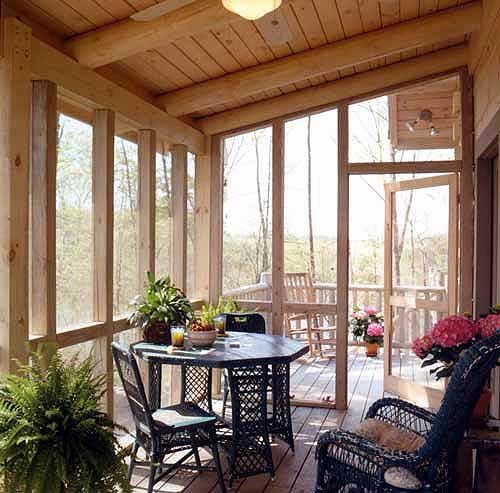 This log home has multiple deck areas encircling the house, including this screened section which is ideal for taking your breakfast outdoors without being bothered by those pesky flies. 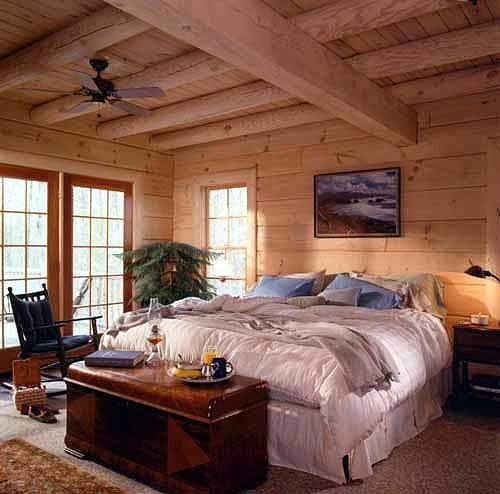 The master bedroom is located on the ground floor and has direct access to the deck via glass doors. It is fitted with walk-in closets and has an attached master bathroom with a whirlpool tub. This house has three bedrooms in total. The second and the third both benefit from their own private bathrooms and generous closet spaces. 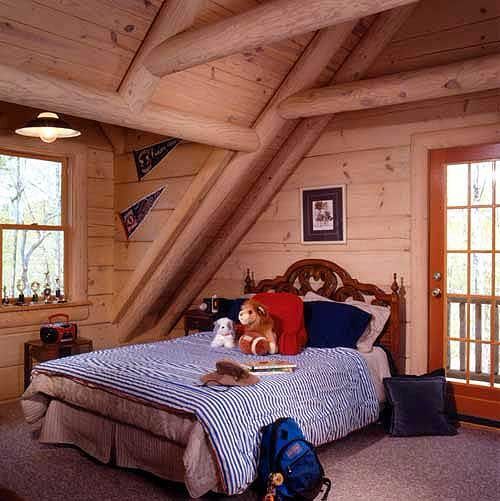 The third bedroom - pictured above - also has access to a private balcony. 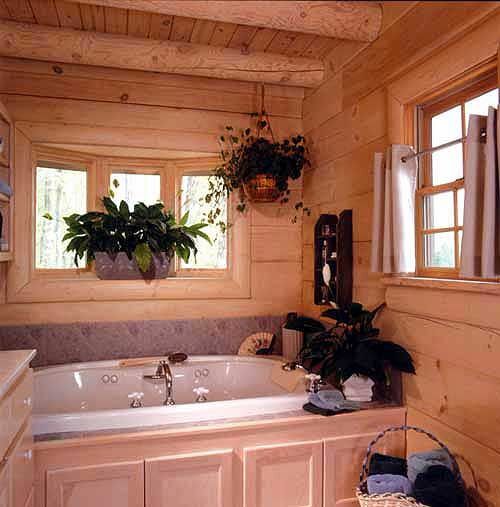 All four of the bathrooms within this upscale log home are tastefully furnished with high-quality fittings. 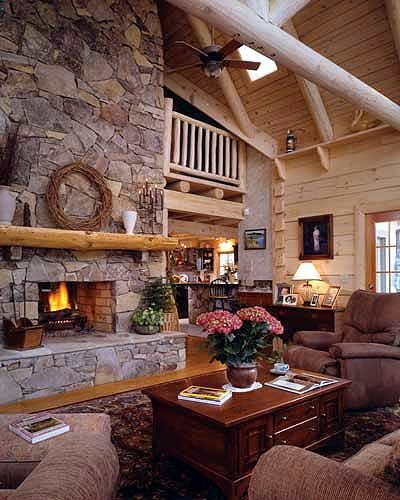 Is this the kind of log home you dream about? Let us know - comment on Facebook and don't forget to SHARE with your friends!